We’re starting to think about ditching Coolest Gadgets and opening up an iDevice accessory factory – the big money seems to be in that segment of the market, although one cannot deny that competition gets pretty stiff after a while. Today, there is yet another iPad accessory to tempt you to part with your hard-earned money, as we’re talking about Bracketron’s Twist360 for the iPad. 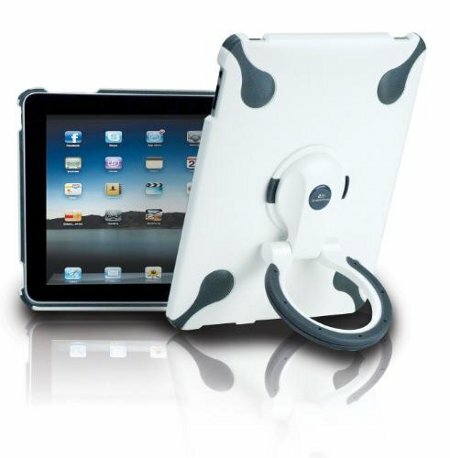 This unique accessory will come with a protective hard case complete with a handgrip which allows you to rotate it 360 degrees or flip it into infinite positions for use as a desktop or lap stand. Thanks to the Twist360, you are able to move between work and play effortlessly, regardless of whether you are at home or when you’re on the go. No idea on pricing at press time, but we do know that the Twist360 will soon be available at many leading consumer electronics retailers and on the Bracketron website.